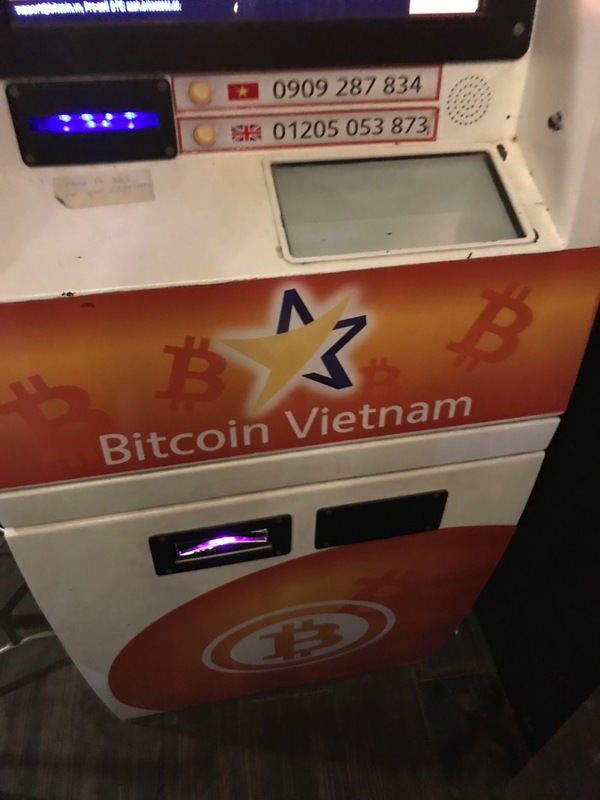 In central Saigon (Ho Chi Minh City), right in District 1, not too far away from the Bến Thành Market, is a great place for you to buy and sell Bitcoin from an automated teller machine (ATM). 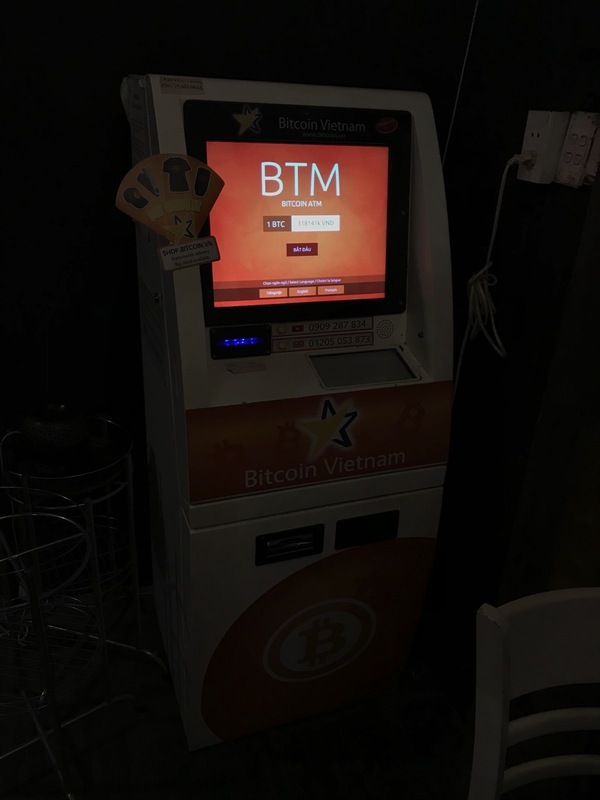 This is one of the two operating Bitcoin ATMs in HCMC that allow you to buy and sell Bitcoin. There are apparently four such locations, which also tell you the buy/sell commission rates. I took a Uber ride from the Park Hyatt Saigon, and while cheap at only 18,000 VND (USD$0.79), it took about 22 minutes to reach in the evening traffic. This might have made sense when I carried some Vietnamese Dong in my pocket, but I figured on the way back, a walk would be better — after all, Google Maps claimed it would only take 18 minutes, and it was definitely about there. In Saigon, it would seem that when you visit an ATM to withdraw cash, many have a 2,000,00 limit; I managed to find one with a 3,000,000 limit (USD$131) which seemed reasonable. Transferwise claims that ATMs should be able to spit out 4,000,000 VND but I did not manage to find one that would provide this at the bank of ATMs nearby the Park Hyatt Saigon, right across the Caravelle Hotel. Anyway, when you arrive, you realise the shop is right at the corner of the street. 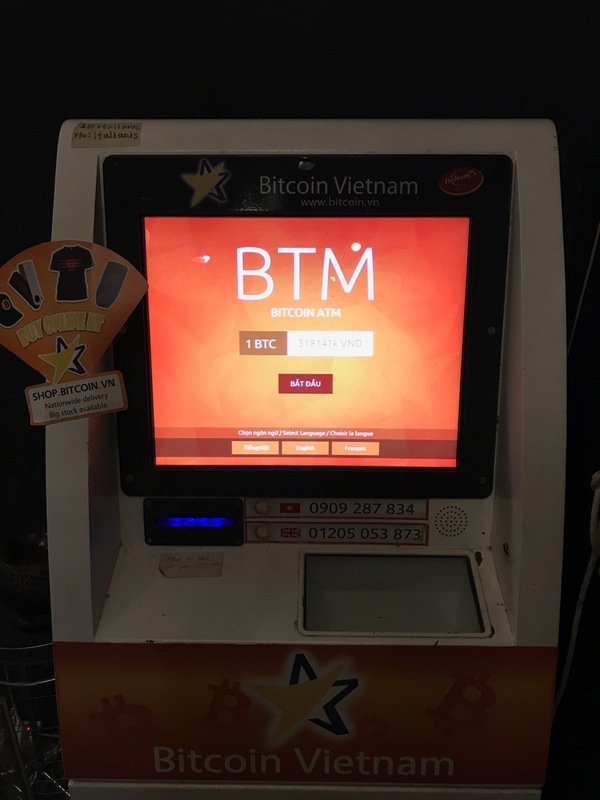 The address for their BTM (they call it a Bitcoin Teller Machine) is 290 Lý Tự Trọng, Bến Thành, Quận 1, Hồ Chí Minh, Vietnam. 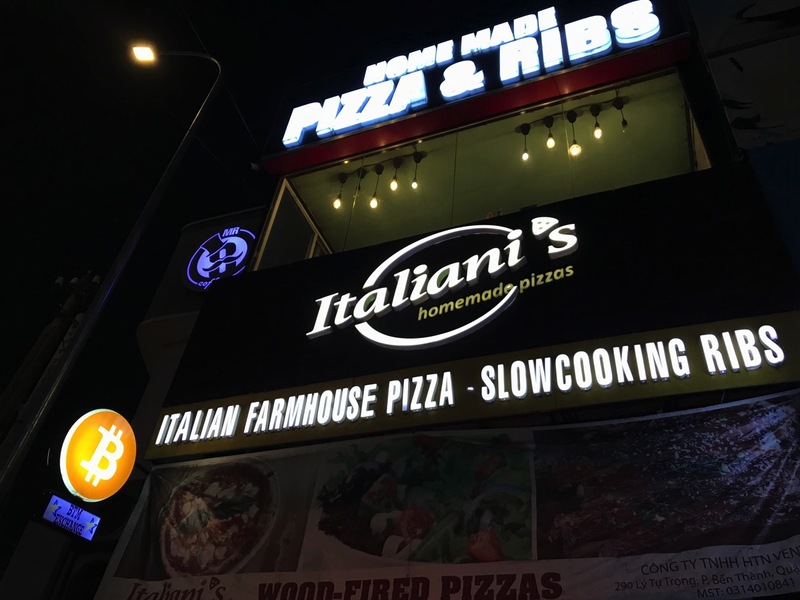 The store is called Italiani’s Homemade Pizza (Google Maps Reviews, Facebook page, Foursquare). Upon stepping in, you get greeted by the friendly proprietor who tells you that the Bitcoin ATM is functioning today, with both the ability to buy and sell Bitcoin without issue. There are times when the network gets too busy or the machine malfunctions. He is also quick to tell you that he just loans them the space, as opposed to actually run the Bitcoin ATM. After a quick chat, I ask if he’s Malaysian or Singaporean based on his accent, and he says he’s a bit of both; I don’t push it. He’s surprised I managed to guess, but has no idea where I am from. We keep it that way, then I head to the back of the store where the Bitcoin ATM is. When I arrive at approximately 8.35pm, the store is empty; when I’m done at approximately 8.45pm, the store has one table of 3 customers. 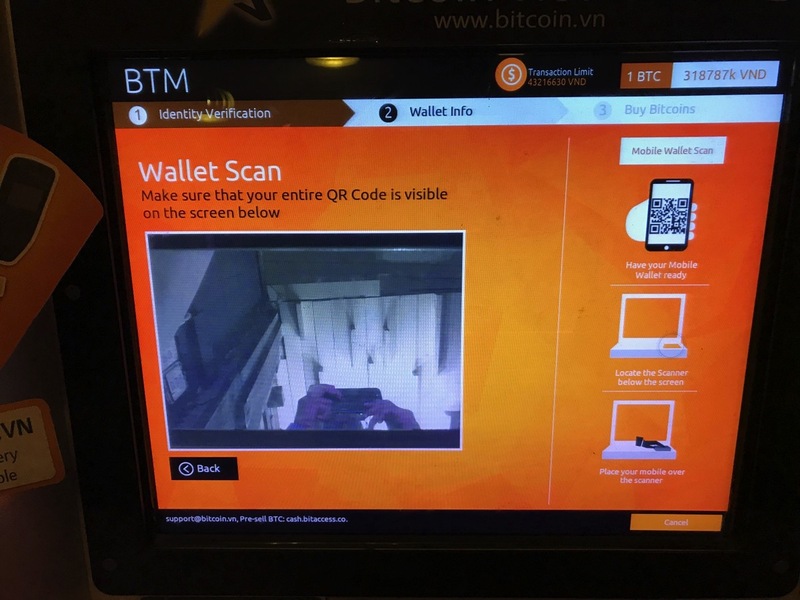 The Bitcoin Teller Machine (BTM) tells me that today, 1 BTC is the equivalent to 318141k VND. 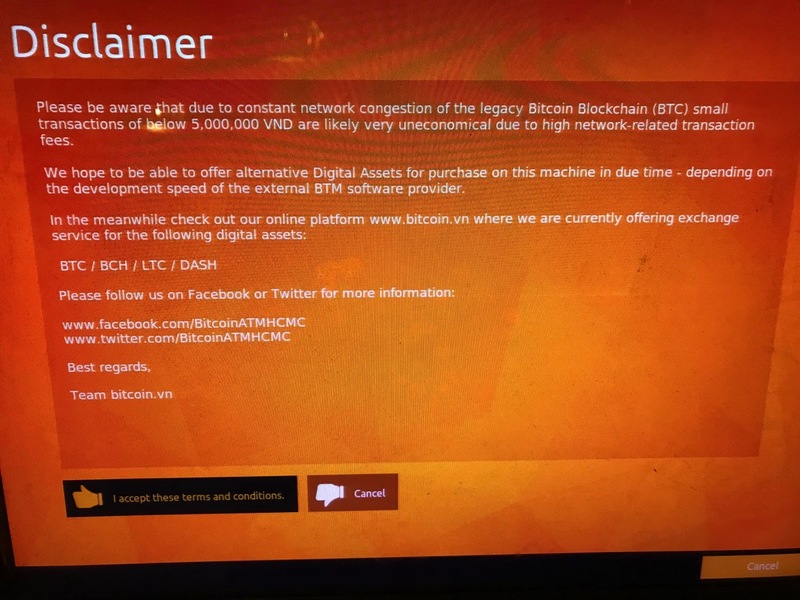 The machine then warns you that any transaction below 5,000,000 VND would largely be uneconomical due to network transaction fees, but you’re still free to experiment with whatever amount you choose naturally. The BTM then asks for identity verification, which is as simple as inputting your mobile phone number. It seems to accept international numbers as well, because that is what I used. You get the 6-digit verification code fairly quickly, and upon inputting it, you have verified your ID. 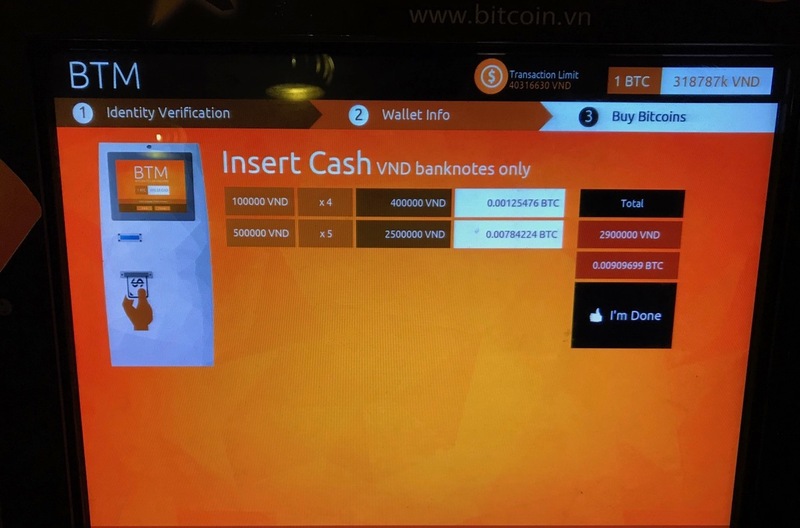 You can choose to buy or sell Bitcoins, and the current imposed transaction limit at the BTM is 43,216,630 VND. This is well above the 5,000,000 VND recommended minimum, and a lot more than the 3,000,000 VND that I have in my pocket. The limit is approximately USD$1,887, which while can’t get you a whole Bitcoin, can at least get you a stash of Vietnamese Dong. You can check your recent transactions (which at this stage should list that your identity was verified). 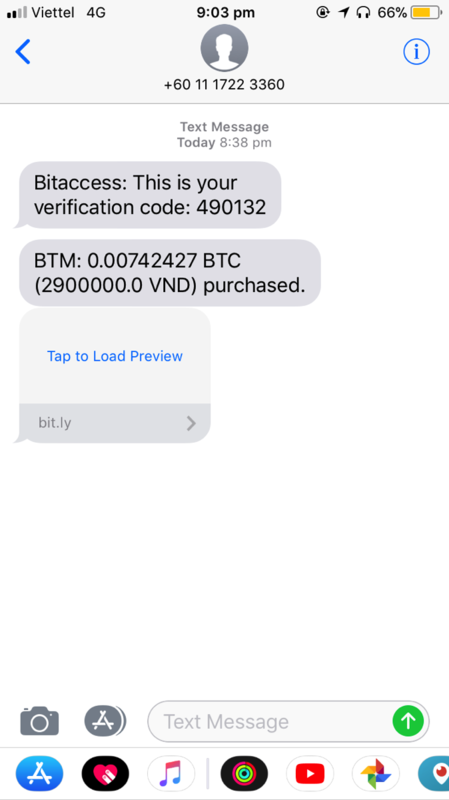 By the time it asks if I have a Bitcoin wallet or not (I did, I did not try to see what happens if I did not have one), the price of 1 BTC is now 318787k VND (up from 318141k VND just a few moments ago). Scanning your QR code is fairly easy. Then to insert cash, you’ll have to look a little lower than expected (there’s even a note saying not to insert cash where the receipt comes out from). It’s easy to insert 500,000 VND which approximately buys you 0.00156845 BTC at that point in time. I eventually fed it all my notes, except the 50,000 VND notes which the machine would reject (so it accepts 500,000 VND and 100,000 VND notes). Armed with 2,900,000 VND now, I get the paltry sum of 0.00909699 BTC, which is quite a hefty premium on the cost of Bitcoin generally. The coins then get sent, you see the wallet address it has sent it to, and you are told your TOP up is successful. There is a warning that it may take an hour for the coins to show up isn’t he wallet, but in my case, I saw it immediately (it did take under an hour to ensure that there were three verified confirmations). You then get a nice printed receipt from BITACCESS telling you what the deal was. In my case the price of 1 Bitcoin was 318786620.37 VND, I put in 2,900,000 VND, and received a total of 0.00909699 BTC. Once you’ve paid the transaction fees, you end up with a paltry 0.0074247 BTC, which is 0.00167229 BTC in fees (this was approximately 533,103.68 VND or USD23.28). You also get an SMS text message telling you the transaction is complete (presumably if you were deciding not to print a receipt). Traditional ATMs do not ever charge you a cash deposit fee. They do charge a cash withdrawal fee when you’re not within the network (in Malaysia, MEPS is approximately RM1/USD0.25; internationally I’ve seen the fee to be approximately USD3/transaction, charged as a service by the ATM provider). Free of Vietnamese Dong, I decide to take a walk back to the Park Hyatt Saigon for a drink. 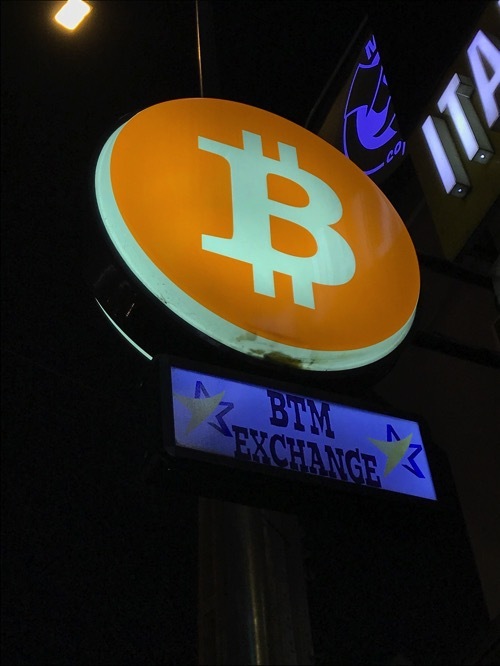 The process of buying from a BTM seems relatively simple, and if I was not taking photos and documenting the process, I presume it would have taken much less than the 10 minutes that I took. It’s still not as fast as doing this at a cash deposit machine (where typically you put in all your notes in a bundle and the machine counts it). I was tempted to try a withdrawal, but knowing the fees, and my lacking interest in having Vietnamese Dong, I skipped this part of the experiment. The last Bitcoin ATM I used was in central Singapore, approximately in 2014. I recall it had a limit of SGD$250 per transaction. Bitcoin back then was also a lot cheaper… It’s interesting to note that sometimes selling of Bitcoin isn’t allowed at these ATMs (maybe it needs cash to be topped up?). You’re advised to always check their Facebook page or Telegram group before you decide to make a transaction.